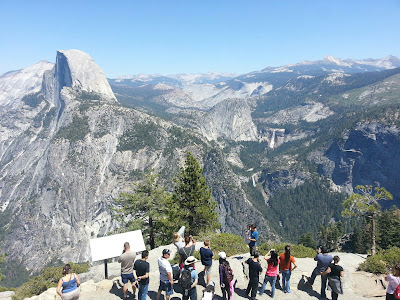 I just got back from a one week vacation in California, and although I wanted to complete last week post, I could not concentrate on physics, so I will postpone that post one more week and today I want to share my impressions from the trip. I visited San Francisco, Lake Tahoe, and Yosemite National Park. I have been to San Francisco before but this time I had more time to explore the city and surroundings. Besides the regular attractions like Fisherman's Wharf, Ghirardelli square, the cable car rides, and the sea lions on pier 39, I went to see the giant redwoods in Muir forest. The view is nice if you can find a parking space: there were cars lined the side of the road for 4 miles next to the entrance. Also coming back to San Francisco I had to cross back on the Golden Gate bridge which just happens to be a toll road in this direction. An ominous sign scare you with a $500 fine for not paying the toll, but when you get to the toll booth there is nobody there. At the toll plaza they take a picture of your license plate and they chase you after. When you google the toll information, you get to the official site which lets you pay the toll within 48 hours. However the idiotic site first asks you to enter the time you pass the toll and then it informs you that from that time forward up to the end of the day you were allowed one crossing. So if you missed the crossing time by one minute you wasted the payment and you are still a toll violator. Also on the negative side, the weather in San Francisco is incredibly cold. The sun is shining brightly causing quick sunburns, and yet the air temperature requires a decent coat in the middle of summer. or you can take a gondola up the mountain for zip lines, high ropes climbing, mountain coaster rides, and rock climbing activities. 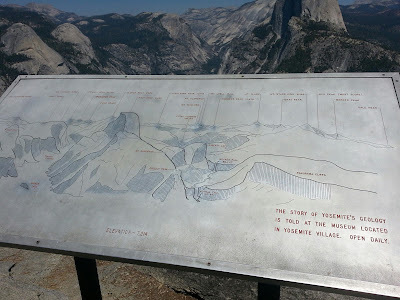 The pinnacle of the trip was the Yosemite National Park. This is a big place of breathtaking beauty choke full of tourists (about 50% were Europeans). The traffic and tourist density surpasses that of downtown Washington DC at the Smithsonian museums. The chipmunks are almost domesticated and they beg you for food every time you start eating anything. The picture above is from the Glacier Point and you see the half dome and the two waterfalls on the center right. The hike to the Nevada fall is a strenuous 6 hours hike (2000 feet elevation difference) and you need to carry 2 liter of water per person to do it. The places to stay inside the park require one year booking in advance, and the first hotel outside the park is about 30 miles away from the center of the valley. 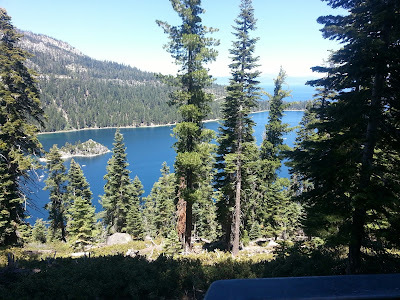 The first day was dedicated exploring the valley and hiking to the waterfalls, the second day I went to the glacier point to see the entire thing, and the last day I drove on the north road of the park to some beautiful views of the high mountains, lakes, and meadows. Everywhere there were long lines: 1 hour to enter the park, 90 minutes to take the free bus to glacier point, two hour drive to the north of the park which is in the far mountains in the picture above. All in all I was deeply impressed by the beauty of the Yosemite which surpasses everything else I saw in the US. I lived in California for a while. Later I was going to rock climb Half Dome, but the trip fell through. I gave up on rock climbing since, for I don't have the body for it these days. I sort of hope to move back there, but the one problem is there are a lot of people there. I tend to like living where there are not mass numbers of people. One thing I liked the most was the night sky: no clouds and no light pollution allowed me to see the Milky Way for the very first time. I lived all my life in cities or suburbia and I never got to experience the stunning beauty of the night sky until now. Half Dome is way too hard, it's a hard climb on the misty trail to Nevada falls, and this is the easy part of the Half Dome hike. The trail is very dusty and you tend to slip on the thick dust.